Weird Wonderful Web: People can change - It's a Christmas miracle! People can change - It's a Christmas miracle! The Christmas spirit brings together this unlikely pair. I'm not entirely sure what the hell is going on here. Okay it's Christmas time; I can confidently risk stating that! 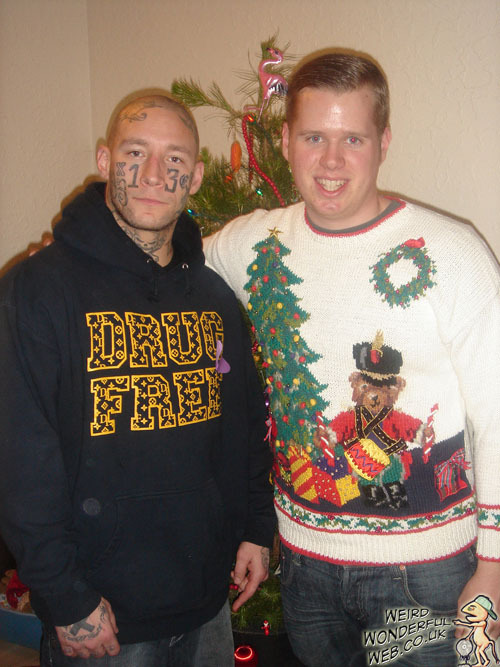 But the Christmas pullover, arm around, pink flamingo on Xmas tree, face tattoos, drug free hoodie combo has me baffled as to how these two ended up in this photo together without the aid of Photoshop! It's got to be a Christmas miracle! Inflatable Xmas house of hell! Is Santa on the naughty list? Piss you a merry Christmas! Some people give crap Christmas gifts! Indian Santa reveals chimney technique! A Christmas card from former presidents Bush! Xmas decorated car complete with reindeer! Elephants have tree-mendous Christmas dinner! Xmas decorated car to Beetle the rest! Be good or Santa gets it! Stack of tyres Xmas tree! Santa went on Pimp My Sleigh! Santa scares the shmiles out of me! Play this...unless you're too chicken! Most depressing Xmas decorated car! OMG trampoline in Dr Who! Batten down ya trampolines Scotland! The mighty Xmas tree of Spam! Canadian beer bottle Xmas tree!